Discussion in 'Flat Earth' started by Rory, Mar 18, 2019. All decent analyses show that it aligns perfectly well with a globe earth model and is completely incompatible with being on a flat plane, yet the gentlemen in question demonstrated that they are unaware of how viewing angles are calculated, and how perspective works. The question, then, is how do we explain how perspective works mathematically; show that calculators do include perspective; and help people who don't understand what perspective is, who struggle with maths, and who are mistakenly convinced that they already have the answers? The theory and methodology is fairly straightforward: viewing angles (angle of elevation) between two points can be calculated using trigonometry. These angles will show where something will appear in a photograph, or in our actual field of vision. Larger angles will appear higher and smaller angles will appear lower. To calculate the angle, all we require is distance and elevation. This shows how the line of sight from the observer in the bottom left corner to each of the peaks forms the hypotenuse of a right-angled triangle, which can then be calculated by tan(x)=opposite/adjacent (that is, elevation over distance). Verifying the theory using distant mountains, however, is difficult to do. So we need a way to do this that is available to anyone. To demonstrate that calculators include perspective, all we need are a list of distances and elevations of some known landmarks and a photograph of these landmarks. Any photograph of a flat-ish street will do, but it would be best if it included buildings of different heights, with some taller buildings in the background. Camera height I believe to be very close to 6 feet - certainly within a foot or so - based on the parallel lines in the images, the vehicles, and the people's heads. I would add each of the predicted points to the image, to compare with the actual points, but it seems a bit redundant, given how close they are: most of them are pretty much bang on, with only three of the ten points varying by more than four pixels, and none by anything approaching significance. I think this well and truly proves the point that perspective can be calculated; that apparent height order can be determined; that both curve and plane calculators do already account for perspective; and that very accurate positions in photos can be predicted merely from the distances to and elevations of landmarks. Spreadsheet containing the calculations used above is attached. This is what i consider a "simple explanation" of "perspective calculations. To calculate Perspective "size" from an observer (point A) to a mountain peak (point B), you divide the height by the distance. Perspective means objects get smaller the further from you they are. The greater the distance from the observer, the smaller the object will appear. Both Mountains are 1000 feet high. Mountain 1 peak is 1000 feet high. Mountain is 5000 feet from the observer. Mountain is 2000 feet from the observer. Mountain 2 looks bigger than Mountain 1 because it is closer to the observer. If you want to determine the elevation angle in degrees from the observer to the mountain peak, you use a scientific calculator. Or Google - which I find much easier nowadays. All in the same order, either way one does it. While that is indeed the simples math, and the way I normally do it (divide by distance!!!) That diagram is just gobbledygook to most people. so if i see something like that "P=(x,f)" that comma means divide? thats why i showed a real calculator because alot of people (ie me) only know 'divide' by the division sign or if the numbers are on top of each other. P=(x,f) means "the point P is a distance f horizontally from O, and a height x above O"
It's a bad diagram in many ways. 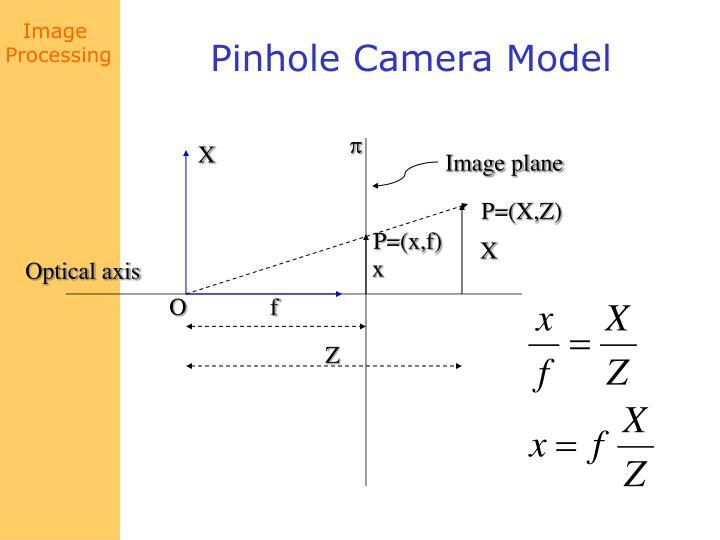 The "image plane" is essentially the back of the pinhole camera, where the image is projected. But here it's in front, which is perfectly normal when you are doing the math, but it's not really clear what is going on. alot of people (ie me) only know 'divide' by the division sign or if the numbers are on top of each other. It's using a key (and very simple) thing called "similar triangles". You can see there's two traingles in the diagram, this one made by the actual point. They are "similar", meaning they have all the same angles. That means the ratio of the sides is the same (it's just the same triangle scaled up). Hence you get x/F = X/Z, or you could say x/X = f/Z, same thing. Then you just rearrange to get a solution for x.
x gives you the size of the object in the image plane. f is like the focal length in a camera. x is like the size of the object projected onto the sensor. Projection in the sense of a camera is kind of like a slide projector in reverse. Instead of the light from the slide being projected on a wall, the light from a scene is projected (via the lens) onto the film. Projection is all about straight lines and similar triangles. There's a view cone called a "view frustrum", which is a good word to search for explanatory images. You could stick a view plane anywhere across the frustrum, and you'd get exactly the same image, because the red lines go through the same point (just scaled). Have a look at it in GE with the attached. Divide by the depth along the line of sight, not by the Euclidean distance. There's a view cone called a "view frustrum", which is a good word to search for explanatory images. It's frustum, not frustrum. I made that frustrating mistake too. Almost as bad as restaurateur. For a while today I was typing fustrum, then changed to frustrum. I've been getting this word wrong in a variety of ways for decades. The calculator I've used above on the 5th Avenue photo is based purely on flat plane trig without refraction. But I thought I'd see how the sphere earth calculator fared, with refraction. Predicted apparent height order is the same (i.e., correct) and the pixel height predictions were very similar. What I immediately notice, though, is that the sphere earth calculator predicts the objects as being higher than the flat plane calculator, whereas they're usually predicted lower. What I found was that something like the tip of the Empire State Building is predicted to be higher with the sphere earth calculator until it's 3.1 miles away, where they're the same. More distant than that, and it will be predicted to be lower. Not sure whether that reflects reality, or a need to fine tune the equations. The second thing I notice is that they're all still predicted very accurately - I'd call within ten pixels "very accurate" - except the same one that the flat plane calculator has as an outlier, the turret of 145. This leads me to believe that the turret is probably a little big higher, or a little bit closer, than the figures I first used. Changing the refraction coefficient makes no difference to the angles. Also, if I change my marker pixel to the roof of the Empire State, rather than the tip, the results are even more accurate. So perhaps a clearer landmark for marker is best. 5th Avenue, by the way, slopes up very, very slightly. Not much for most of this length, but around 20 feet higher up by the Empire State. It doesn't make any significant distance to these calculations though. Can you share that spreadsheet? What I immediately notice is that the sphere earth calculator predicts the objects as being higher than the flat plane calculator, whereas they're usually predicted lower. I think it has been mentioned before that a simple ratio of pixels to visual angular size is a very good approximation when the angles are relatively small, but may be inaccurate (as compared with a photograph) when the angles are large. Very tall buildings, close to the observer, may be a case in point. In your New York photo some of the angles are over 15 degrees. I haven't worked out the maths, but this might be why some of your predictions are a bit off. Hang five: I'm pretty sure it's the latter. I had a bit of an issue with the obstruction calculator that I did, where it worked differently for points above or below eye level, and the same may be happening here (mountains below, buildings above). Creases being ironed as we speak. With Mick's help, the equations got fine-tuned. The problem was that I'd simplified the...meh, it's not interesting what the problem was. In a nutshell, the sphere earth (refracted) predictions are exactly the same as the flat earth (unrefracted) predictions for the 5th Avenue photograph. Well, to about 5/1000th of a degree. This is good: now there are two calculators, one for flat and one for sphere. The sphere earth calculator works perfectly on both long range (South Sister to Rainier) and short range (5th Avenue). The flat one only works on short range - and if it's made to work on long range, it won't work on short. I'm just gonna streamline it a bit more, and then I'll post it in the tools section. @Rory i watched your latest video and read the chat w/ Sleeping Warrior. When they look at the photo of Rainier, they think they are looking at a Flat Earth. He says perspective doesnt really matter. He says part of the mountain is missing because of refraction, not just the mountain shrinking due to perspective. We know that what is missing is The Hidden due to Curve+(or minus) refraction. They dont believe in the curve. So they think what is missing is ALL refraction. And since refraction can bend different ways, especially over 180miles... basically that is their answer to everything. It's a good answer actually. Until i wonder what the atmosphere would have to be doing to make almost all of Rainier disappear on a FE. Maybe that could be a debunking angle? I may have this backwards.. ex. if light 'goes up' when its colder below and warmer up top. And Rainier went down.. so it would have to be what like 3000degrees farenheit near the earth and like -1000 degrees where the camera man is, to get the light to bend Rainier down that much. I think so. Inventing something like "upward refraction curving at a rate of 8 inches per mile squared" might help them. The temperature thing would be more Mick's department, though. I'm not sure how that would work. I think the crux is them not really understanding angles or perspective. Things in the distance are smaller, and closer to the horizon (than when they're closer). That pretty much does it for them, as far as an explanation for Rainier goes. But if they were able to take in the whole scene, and think about it a little more deeply, then they'd see why it doesn't work. I don't think so. I dont think they are ever going to see. He thinks we cant count the hidden part of Rainier in the math. meaning Rainier is not 14,400 feet. It is like 4,000 feet high. and St. Helens is like 1,000 feet high. He is saying my FE model doesnt work (ergo your math doesnt work) because on a FE it wouldn't look like my FE model. On their FE it would look like the real Rainier pic. So the math has to be wrong. I think what they are doing is (i could be wrong) they are thinking the whole bottom of Rainier is just missing because of refraction compression. Sorry this is so small, an 180 mile side view model is BIG and hard to get in one shot. If you take my yellow lines and compress them together.. I think that is what they think is happening. It's like the mandela effect.. in our reality we know your math and my model is right. but in their reality, it is wrong because they are living in an alternate reality. Theyre saying 'angular size' and 'perspective' but i think what they really mean is 'compression'. The math and my model dont take [their imaginary] refraction compression into account. @deirdre no, it's not compression. Compression happens when the gradient of optical density is uneven. And yes, they are working backwards from the assumption that Earth is flat, and making their physics fit that, which is what they're accusing us of doing with the globe. John D is leaving pressure out of his refraction considerations, and that leaves him with a temperature gradient with cold air on top, which bends light upward as long as you forget that buoyancy really prevents denser air to be on top of less dense air. If we follow the notion that a constant gradient bends light in a circular arc, then assuming the necessary k-value (like -0.83) will yield globe Earth appearances on a flat Earth. This works fine as long as you never attempt to measure it, and nobody questions why you illustrate your flat Earth refraction tutorials with upside down pictures of downward refraction. And this whole discussion about "how can we explain perspective calculations" is about the merits of an argument and not about evidence. You can show that air pressure affects refraction in the lab by measuring the refraction of light passing through a transparent vacuum chamber, but it's difficult because the optical density of air is already very close to vacuum, and the easiest experiment I have seen described uses interference patterns, which are not very intuitive. I actually don't think they're thinking about it at all. Somebody made a video proposing that curve calculators didn't take perspective into account - Taboo Conspiracy, which was looked at here - and people like Riley and Oakley simply took the headline and conclusion, repeat it whenever presented with anything that appears to challenge their viewpoint, and believe that's enough. This seems to be pretty standard practice among flat earthers: one person says "but that's atmospheric lensing" - or "angle of attack" - or "compression" - or "looming" - or "how our eyes work" - or "angular resolution" - or, gulp, "perspective" - as though simply saying the words counts as an explanation, and others then thoughtlessly repeat it. Obviously that happens on the debunking side too - but generally it's not too much of a problem, since the explanations are usually right, if not always understood; and if someone among the debunkers proposed a faulty explanation for something - certainly here, and even on YouTube - it would be immediately challenged and the correct explanation arrived at. At least, that's been my experience so far. seems we all agree. the mountain LOOKS smaller due to distance.. and distance is calculated in the curvature calculators. End of story. From my perspective this sounds like you need a phenomenon called refraction to account for the difference (which co-incidentally occurs on all images where you can see too far). [It] needs more faith to believe in the power of refraction phenomenon than actually just witness what is, in reality, what my eyes are showing me. Now, while I might have some ideas as to why they understood my words in this way, it does also seem worth clarifying what I meant by them, just in case someone else comes to the same conclusion. Basically, the point was not that refraction causes the difference between the two models in the 5th Avenue photo, but that, over such a short distance, there's essentially no difference here between flat and sphere. The curve is minute. The street is, for all intents and purposes, flat - and, indeed, any changes in local terrain will be vastly larger than the miniscule amount of curve over 4000 feet (mere inches). As shown, though it makes a big difference to the figures in the righthand columns (based on the radius of the earth in feet), only one angle shows a change (and then by only 0.00019°). Angles change a little more this time - obviously - but the predicted order still stays more or less the same - the more distant mountains are most affected - and the results are still within about 1/10th of a degree of what we measure in reality. Just in case any flat earthers are reading this, I hope that clears it up for you: it's curve that makes the difference here, and which makes the mathematics match reality, not refraction. In the distance is Mount Rainier, and I wondered, with the smattering of tall buildings in the foreground, whether this image couldn't be used to demonstrate the curve of the earth, using the perspective calculator. In terms of predictions, the only real difference - by more than 0.01° - is the position of Mount Rainier: the sphere earth calculator has it below 1420 5th Avenue, while the flat earth calculator has it above it - a 0.2° swing either side. Where's the curve, Darryl and Mark? It's a fun little exercise, but because the margins are quite small - it's not such a dramatic demonstration as the South Sister image - I don't think I'll be offering it as a challenge to flat earthers. Something a bit more conclusive and less finicky is better. Do you have a precise location for the camera? 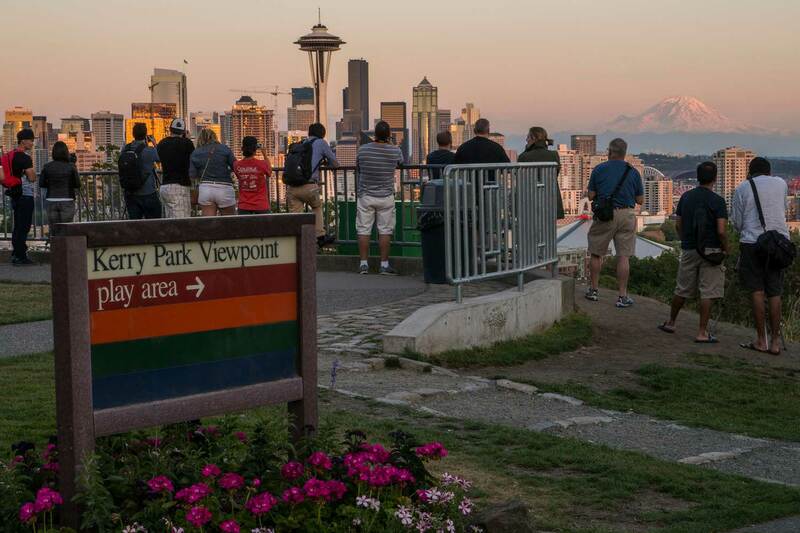 I know it was taken from Kerry Park in Seattle - famous overlook - but precise location I'm not sure. It looks like Darryl's is a little to the west of Mark's, judging by the alignment of the Space Needle and the Columbia Center. Which seems to be taken right from the center of the park. This coordinates for the image above, right by the sign, are 47.629505, -122.360542, and the elevation for that point is given as 341 feet in WGS84. So, again, Rainier is the big mover. The only thing I'm wondering about here is the elevation of the skyscrapers. For the 5th Avenue, Manhattan picture it wasn't an issue, as it was all taken from street level. But for these ones I had to find ground level above sea level and add it to the building height, which may not be as accurate. I guess it all depends on how foundations and levelling is factored in. For the 5th Avenue picture it wasn't an issue, as it was all taken from street level. i assume you mean 5th avenue in Manhattan. as opposed to the 5th avenue address in your chart above. BTW youhave #6 as MT Rainier in your first pic.. so i still dont know what "1420 5th avenue" in Seattle is. Fixed. Thanks for the spot. Peaks - and one building - are ordered here by their actual height in the panorama (pixel in photo). A quick glance down the predicted angle columns shows just how closely the sphere calculator comes to getting the positions right, with just a couple of those very close together (in both the image and their predicted angles) switching places. The flat results, on the other hand, bear no resemblance to reality: perhaps most notably in the case of San Jacinto, which is level with the US Bank Tower, but should be far above it; Kitching Peak, which should have 8 landmarks below it, but isn't visible at all; and Tahquitz Peak, which ought to be a good half-degree above Workman Hill, but is at the same apparent height. Also for the sphere earth, the pixel position can also be predicted, and this is shown in the far right column. All 23 visible landmarks are within 5 pixels of the calculator prediction, and 17 of them within 2 pixels. Doing the pixel prediction for the flat earth is difficult, since there are no two points that can be said to be accurate, but the best I could get it gave an average discrepancy of about 40 pixels, plus or minus. I was thinking how best to present this, but, though it's a really nice example of how well relative positions can be predicted, it's probably a bit complex, and the South Sister shot is still the best and clearest for the purpose. It's not so much about any difference between the two models - as far as the mountain goes, there's barely any - but providing an example and a way that people can demonstrate for themselves that there's no great mystery as far as curve calculators go, and that perspective is very obviously included in the equation. Note: if anybody wants to do such a small scale test, they have to be extremely right on with the measurements. Unlike long range shots, where camera height can be within 10 or 20 feet and still give the right results, something like the above needs to be pretty much accurate to the centimetre, as small changes make big differences to the resulting angles.